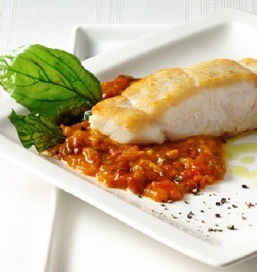 *Choose one herb for the sauce from the herb choice you are using to prepare the halibut. evaporated. Add the orange juice to skillet and continue cooking until mixture is thick and jam-like in consistency, about 10 to 13 minutes. Remove the skillet from the heat, and add butter and mint immediately, whisking to blend. Add sugar and seasonings. Taste and adjust the seasonings.